Considering its status as the poster child of high-end Android smartphone-ing, it’s only natural that we should be a little excited at the prospect of the Samsung Galaxy S5. Set to be announced at the Mobile World Congress at Unpacked 2014, many leaks and reports have tried to pin down a legitimate list of tech specs, but now, a shot of the device’s packaging looks to have confirmed the hardware within the forthcoming handset. Suffice to say, it’s every bit as powerful as we’d reckoned. 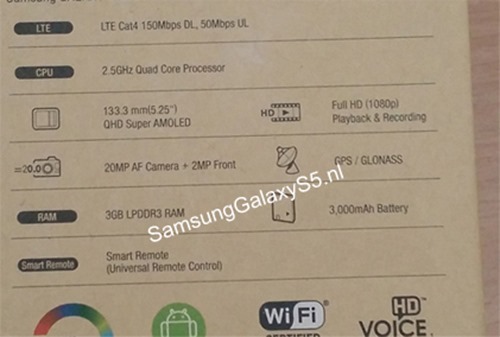 Judging by the leaked photo of the packaging first published by the guys over at SamsungGalaxyS5.nl, the Galaxy S5 will be an absolute beast. Although it has been rumored that there will be two different versions of the handset from the get-go – one solidly high-end and the other an outright powerhouse – I think it’s clear, if this is to be the case, which variant our leaked specs list describes. As well as a 2K, 5.25-inch Super AMOLED display, there’s a 2.5GHz quad-core processor, a 20-megapixel rear-facing camera and a 2-megapixel front camera. There’s also 3GB of LPDDR3 RAM, IR Blaster, 4G LTE and a monstrous 3,000 mAh battery to keep things ticking over. If this leak is legitimate, we can probably assume that it refers to the top-end edition of the Android and Samsung flagship, and although we’ll have to wait for the Unpacked 5 event at the start of the MWC before we can know for sure, two weeks suddenly seems like a long wait for such a mighty handset. Samsung Unpacked kicks off on February 24th, and will stand us in very good stead for the rest of the Mobile World Congress, which runs through February 27th. We’re likely to see two different smartphones at launch, with analysts suggesting that the more powerful one will cater to the U.S. market while the slightly less beefed-up device will serve Europe. Whether we’ll be getting two dramatically separate devices right off the bat remains to be seen. But one thing is almost certain – there will be many, many more strains of the Galaxy S5 released throughout the year and beyond – with different colors, mini versions, camera-centric and ruggedized editions all having been done before with the S4.